A complex for organizing personnel documentation: recruitment, vacation, sick leaves, discharges etc. The main purpose of this functional module is the implementation of corporate financial accounting in accordance with internal accounting rules and standards (which may be different from Russian standards) to obtain more detailed and specific financial information for business management. Automatic control of liabilities limit etc. 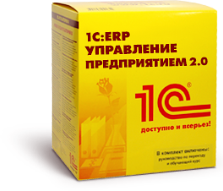 "1C:ERP Enterprise Management 2" (1C:ERP 2) is an innovative solution for building complex information management systems for multi-industry enterprises, as well as for technically complex production, according to the best world practices for automation of large and middle-sized businesses. The quality of the implementation of projects from the First Bit is confirmed by the top positions in the 1C ratings including "1C:ERP Center". Free expert assessment for understanding whether your enterprise is suitable for ERP Enterprise Management 2. Management and financial consulting: audit of business processes implementation of the system of budgeting, management accounting, KPI system. Service support for ITIL and SLA standards and optimization of corporate information systems performance. Specialists of "First Bit" company have a unique experience of automation of large enterprises, more than 650 implemented ERP-projects. Flexibility and productivity of the platform, the ability to manage it from mobile devices, using cloud technologies. Manageable forms as innovative mechanism for creation of target reports and analytics. Innovative functionality for managing production, processes, assets and resources of an enterprise. The full range of capabilities of modern ERP-systems and all the advantages of 1C: Enterprise 8.3. platform. Enhanced functionality in the following blocks: finances, KPI, supply management, HR. Variety of specialized solutions enhancing the capabilities of the system on a single platform: PDM, MES, EAM, PMO, ITIL, CRM, MDM, WMS, TMS,BSC, ECM, CPM etc. Ideal conformance of the system to the needs of manufacturing enterprises, high economic effectiveness and easy scaling in case of the increase in production. Report: "Cost of output products"
Report: "The gross profit of the enterprise"
Need an expert’s consultation or an on-site/remote demonstration of 1C:ERP 2?